Border Police officer is killed by a misfired bullet. A Border Police officer was killed Thursday when a misfired bullet hit him in the chest. 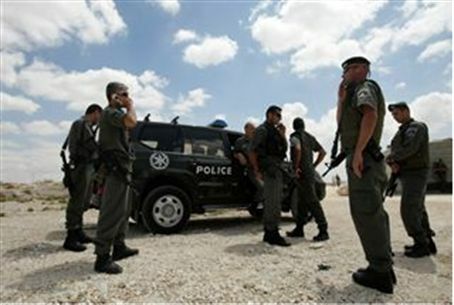 The incident took place at a training base in Michmash, north of Jerusalem. The accident occurred as the officer checked his gun. The officer suffered serious injuries and was taken by helicopter to the Hadassah Har Hatzofim hospital in Jerusalem. He died of his injuries a short time later. The officer has been identified as Staff Sargeant Chaim Chalsetzi. Chalsetzi was laid to rest at the military cemetery in Netanya, Thursday evening. He is survived by his parents and a brother. The accidental self-shooting is the first of its kind in several months. Following the incident, commanders stopped exercises at the base pending an investigation. The Michmash training base is used primarily to train new Border Police recruits. Trainees practice firing various weapons and using grenades.